HIGHLANDER is equipped with SRS, which consists of a driver airbag, front passenger airbag, side airbag and curtain shield airbag. Failure to carry out service operations in the correct sequence could cause the SRS to unexpectedly deploy during servicing, possibly leading to serious accident. Further, if a mistake is made in servicing the SRS, it is possible that the SRS may fail to operate when required. Before performing servicing (including removal or installation of parts, inspection or replacement), be sure to read the following items carefully, then follow the correct procedures indicated in the repair manual. Wait at least 90 seconds after the ignition switch is turned to the "LOCK" position and the negative (-) terminal cable is disconnected from the battery. Do not expose the horn button assy, front passenger airbag assy, airbag sensor assy center, airbag front sensor, front seat airbag assy, side airbag sensor assy, curtain shield airbag assy, airbag sensor rear, seat position airbag sensor or occupant classification ECU directly to hot air or flames. 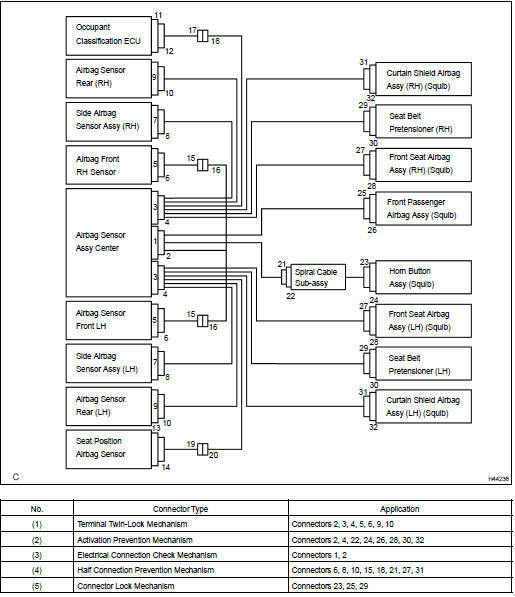 Be sure to perform the initialization of the occupant classification ECU if any of the following conditions occur (see page 05-1203 ). If the initialization is not performed, the SRS may not operate properly. Accessories (seatback tray or seat cover, etc.) are installed to the vehicle. Both the SRS warning light and passenger airbag ON/OFF indicator light ("OFF") come on. The vehicle is brought to the workshop for repair due to an accident or collision. Malfunction symptoms of the SRS are difficult to confirm, so DTCs are the most important source of information when troubleshooting. When troubleshooting the SRS, always inspect DTCs before disconnecting the battery. Even in the case of a minor collision when the SRS does not deploy, the horn button assy, front passenger airbag assy, airbag sensor assy center, airbag front sensor, front seat airbag assy, side airbag sensor assy, curtain shield airbag assy, airbag sensor rear, seat position airbag sensor and occupant classification ECU should be inspected (see page 60-1 1). Before repair work, remove the airbag sensor if any kind of shock is likely to occur to the airbag sensor during the operation. Never use SRS parts from another vehicle. When replacing the parts, replace them with new ones. Never disassemble or repair the horn button assy, front passenger airbag assy, airbag sensor assy center, airbag front sensor, front seat airbag assy, side airbag sensor assy, curtain shield airbag assy, airbag sensor rear, seat position airbag sensor or occupant classification ECU in order to reuse it. If the horn button assy, front passenger airbag assy, airbag sensor assy center, airbag front sensor, front seat airbag assy, side airbag sensor assy, curtain shield airbag assy, airbag sensor rear, seat position airbag sensor or occupant classification ECU has been dropped, or if there are any cracks, dents or other defects in the case, bracket or connector, replace it with a new one. Use a volt/ohmmeter with high impedance (10 kW/V minimum) for troubleshooting the electrical circuits. Information labels are attached to the periphery of the SRS components. Follow the instructions in the caution. After work on the SRS is completed, perform the SRS warning light check (see page 05-1207 ). When the negative (-) terminal cable is disconnected from the battery, the memory of the clock and audio system will be canceled. So before starting work, make a record of the contents memorized in the audio memory system. When work is finished, reset the audio system as it was before and adjust the clock. Never use a back-up power supply from outside the vehicle to avoid erasing the memory in each memory system. If the vehicle is equipped with a mobile communication system, refer to the precaution in the INTRODUCTION section (see page 01-5 ). (a) All connectors in the SRS are colored yellow to distinguish them from other connectors, except the seat position airbag sensor connector and the occupant classification ECU connector. 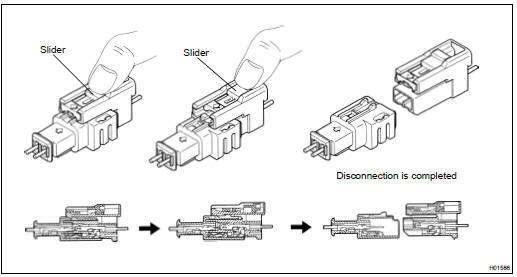 Some connectors have special functions, and are specially designed for the SRS. These connectors use durable gold-plated terminals, and are placed in the locations shown on the previous page to ensure high reliability. Terminal twin-lock mechanism: Each connector has a two-piece component consisting of a housing and a spacer. This design enables the terminal to be locked securely by two locking devices (the retainer and the lance) to prevent terminals from coming out. Activation prevention mechanism: Each connector contains a short spring plate. 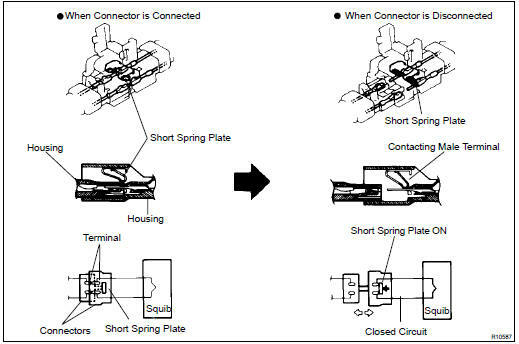 When the connector is disconnected, the short spring plate automatically connects the positive (+) terminal and the negative (-) terminal of the squib. Electrical connection check mechanism: This mechanism electrically checks that the connectors are connected correctly and completely. 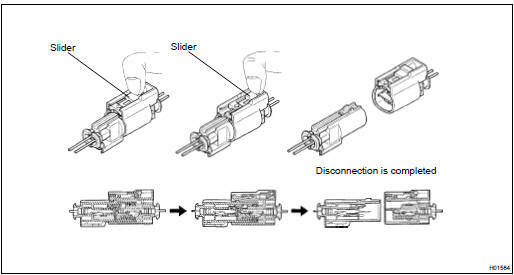 Half connection prevention mechanism: If the connector is not completely connected, the connector is disconnected due to the spring operation so that no continuity exists. Connector lock mechanism: Locking the connector lock button connects the connector securely. (b) When the vehicle is involved in a frontal collision in the hatched area (Fig.1) and the shock is larger than the predetermined level, the SRS is activated automatically. The safing sensor is designed to go on at a smaller deceleration rate than the airbag sensor. 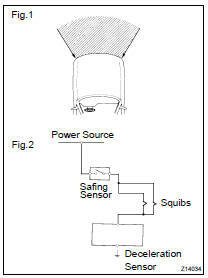 As illustrated in Fig.2, ignition is caused when current flows to the squib, which happens when the safing sensor and the deceleration sensor go on simultaneously. When a deceleration force acts on the sensors, 2 squibs in the driver airbag and front passenger airbag ignite and generate gas. The gas discharging into the driver airbag and front passenger airbag rapidly increases the pressure inside the bags, breaking the horn button assy and instrument panel. The deployment of the bags then ends, and the bags deflate as the gas is discharged through discharge holes at the bag's rear or side. 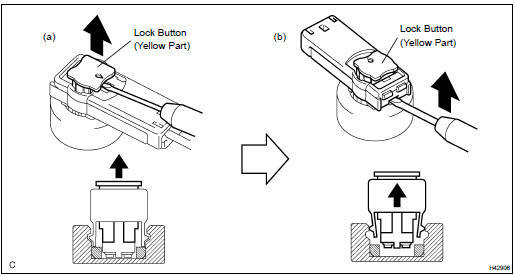 (a) Release the lock button (yellow part) of the connector using a screwdriver. (b) Insert the screwdriver tip between the connector and the base, and then raise the connector. HINT: When connecting, the slider will slide. Be sure not to touch the slider while connecting, as it may result in an insecure fit. (a) While holding both outer flank sides, slide the outer in the direction shown by the arrow. (b) When the connector lock is released, the connectors are disconnected . HINT: Be sure to hold both outer flank sides. Holding the top and bottom sides will make disconnection difficult. HINT: When connecting, the outer will slide. Be sure not to hold the outer while connecting, as it may result in an insecure fit.